Being on the doorstep in constituency 13, Devonshire North Central, has been an incredibly rewarding experience. Representing a party that strives to make our country work better for it’s residents, I have heard first hand the hopes, difficulties, triumphs and desires of constituency 13 members. Jobs and the economy, seniors, education, and the need for good governance are among the areas of concern that we frequently hear from the Bermudians we speak to, and this experience has caused me to once again renew and strengthen my commitment to tackling these issues, namely through the advancement of the policy positions of the Progressive Labour Party, laid out in our Reply to the Throne Speech. The Progressive Labour Party sees that our island needs an education system that gives our children the ability to become critical thinkers and informed scholars, able to compete on the local and world stage. Our seniors who paved the way must be able enjoy and live out their retirements with dignity, and the ability to live meaningful and fulfilling lives without being cast as unwanted government expenditure. Our seniors must have health care that allows naturopathic and holistic treatment, addressing the cause of illnesses, rather than simply treating the symptoms. Our young and middle aged adults desperate for work should no longer be subject to policies that put Bermudians second, and make finding meaningful employment impossible. While the Premier and his government are content to solve our employment problems through pointing our youth to careers in farming, the PLP stand for economic diversification through attracting industries such as FinTech, which will provide opportunity for our people. These differences in approach the priorities of each party, and I am pleased to be a part of a PLP that stands strong for Bermudians. In a country where our seniors are struggling, our infrastructure is being neglected, our economy is in need of diversification, our schools are targets for heavy budget cuts and our youth are turning to disruptive behaviour, this by-election will serve as an indication of the direction the people of Bermuda wish to see this country go. Now more than ever, our people need representatives that unapologetically advance their interests, representatives that ensure legislation passed is advantageous for our people, and representatives who listen and act. These things I endeavour to do with the support of constituency 13. But in 14 years all the PLP did was add to the Ministry of Education bureaucracy, appoint a new Minister almost every year and lower standards. Yet now you have all the answers (without actually proposing any…) Zero credibility. the oba seem to following that trend quite closely themselves…. Does the PLP believe that insurance premiums won’t be raised by the insurance companies if they force them to cover sugar pill and placebo treatments? Naturopathy is dangerous pseudoscience that is at best a waste of money. Naturopathic practices are unchanged by research and remain a large assortment of erroneous and potentially dangerous claims mixed with a sprinkling of non-controversial dietary and lifestyle advice. Naturopathic medical school is not a medical school in anything but the appropriation of the word medical. Naturopathy is not a branch of medicine. It is a hodge podge of nutritional advice, home remedies and discredited treatments…Naturopathic colleges claim accreditation but follow a true “alternative” accreditation method that is virtually meaningless. They are not accredited by the same bodies that accredit real medical schools and while some courses have similar titles to the curricula of legitimate medical schools the content is completely different. Why would you speak out against your PLP ? I’m Onion, not to be confused with Onion Juice. More PLP fluff….PLP issued more work permits. OBA have now passed that all permit renewal jobs be on jobs board. OBA are more for Bermudians than PLP ever were or are. Diallio is just spouting off standard lines…You want someone that ACTUALLY works for you and doesn’t just spout off lines, then Andrew is your person. Lol I actually laughed out loud at that garbage you wrote. The quote then comment formart is making it abundemtly clear that you are engaging with multiple names. Please take a break and stop the unnecessary negativity! You have spoken well, represented your party well. The comments for the future of this country which currently ignores quality of life for all will be adequately addressed with your input! BEING UNAPOLOGETICALLY improving OUR interests is great! All will benefit from that comment…. not just a few, which is what is currently causing havoc on this small island! The other day you were lambasting the OBA for ‘tinkering’ with our public education system and how detrimental it would be for our youth. But you vehemently support a Party who has explicitly stated that they will overturn the current structure as well as input a whole new curriculum! So you’re against ‘tinkering’ but somehow all for a complete renovation? Makes no sense. But Party politics and their supporter rarely do. I guess I was wrong PLP comments is apparently what people really need. If you want lipservice vote PLP. If you want progress for Bermudians, vote OBA appears to be your message ! Well said Diallo. You have worked tremendously hard and the voters in C13 will reward you. Andrew is a good candidate, and a good person, and this by election has been handled in good spirit by you both. I, however, believe that the OBA needs to pay the price for their ill treatment toward seniors, their inaction toward diversifying the economy, and their stubbornness towards this airport deal.The OBA should not be rewarded by the residents of C13 for these traits by having an extra parliamentary seat. Instead, I believe the PLP should maintain their numbers in the House, and keep it close enough to try and keep the OBA honest. 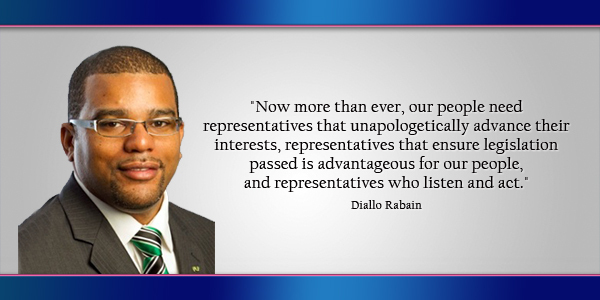 I believe Diallo will be an asset to the PLP team in the House in this regard. I look forward to a PLP victory in Devonshire North Central on Thursday evening. You do realize the need to cut back is solely and directly linked to the PLP’s massive mismanagement of the public purse. - In 2010, 2011 and 2012, cash ended in significant overdrafts that were in the millions. Accounts receivable grew (meaning taxes and revenue owed to government may not have been collected), accounts payable and long-term debt increased significantly each year along with the accumulated deficit. - Government debt, pension liabilities, and net overspend expenditures outweighed government assets each year by more than $300 million for each of the three years. - Accrual accounting is the method whereby all transactions, whether revenue received or not, expenses spent or not, assets or liabilities, pending or otherwise, are duly recorded if they were incurred within a one year time frame. Accordingly, after backing out accrual numbers for all years 2010, 2011, 2012, there was no money left. Our government bank accounts were in negative territory — overdraft. Negative cash balances throughout the report. And yet you believe the OBA should ‘pay the price’ for having to deal with the poor financial position which the PLP left behind? The PLP shouldn’t be rewarded for their actions which have brought Bermuda to her knees. But don’t fret as I also believe Rabain will win on Thursday. For one thing I have to admit the PLP are amazing at propaganda, but when it comes to governing in a responsible manner not so much. Amazing at propaganda, we WILL provide 2000 jobs, we WILL have a Referendum, we WILL look out for our seniors and we WILL do the best for our students. And then they looked under the hood and saw the PLP dismantled the whole engine. How come you never talk about the AG reports issued identifying massive mismanagement of our funds? You have no right to complain about cut backs if you have no problem with the poor management of the PLP. We WILL give you free tuition at Bermuda College, we WILL give you free public transportation, we DO HAVE 100 buyers lined up for Grand Atlantic, we WILL be breaking ground at the Grand Hyatt in November 2011, the economy WILL bounce back next year in 2011, the ‘year of recovery’. ONion Juice, The jobs are coming. Wait Dialio has worked extremely hard and now should be rewarded with votes?????? What did he do, walk and talk, that isn’t hard work !!!!!!!! Getting getting things done is what we need, not walk and talk. I shake my head at the lack of substance the PLP offers. Hot air for sale at PLP headquarters (only on sunny days). now that we have spat off at the mouth, why not for once get off our a** . We continue to biach about what continues to take place around us. We come home to our comfort zone refusing to come out. We the people have the power (right) to form our own board, hold politicians accountable for their actions and even have them removed. The only difference between them and us is they make the sacrifice to become a politician, what a sacrifice it is. to hear you the people biach every time they make a decision. If you think you can do better then make the sacrifice and stop biachen. I think it is time for Mr. Rabain to visit his GP as there appears to be something wrong with his short term memory. It is only four years since his party had every opportunity to rectify what he sees as existing problems. If they had carried out their pre-election promises for all of the years the PLP were In power, perhaps we would not be dealing with them now. Mr Rabain, did you forget the OBA inherited a massive debt as a result of your party’s overspending? These issues would be non existent had your party been prudent in their financial management of taxpayers money. To beat the PLP, you must know the PLP . While the OBA goes for the HEAD , the PLP goes for the HEART. You must understand what I’m saying. Telling the Truth does not win elections. Telling Constituency 13 the problems left by the PLP means nothing. The people want to be told nice nothings . They don’t want to know how things are going to be done, it only needs to sound good while you’re saying it, and the election is yours. Just like the U.B.P. election promise. The elephant in the room for Mr Rabain and the PLP is the Auditor’s report. Many of the voters have read it, and they finally realize that the money concerned is actually their (Bermuda’s) money and not some nameless unlimited fund. Well that is the biggest elephant but there are others. Hoping that Mr. Bean is serious about cleaning house. That way those in the Auditor Generals Report will lose the ability to screw us over again! While we’re at it, add Mr. Burt onto the list as his credebility has become non existent. ….and take down that tacky sign at Loyal Hill. We can all form our own opinions thank you, this is Bermuda not some flippin’ communist propaganda state. I believe that sign was placed by loyal hill residents, not the party or Mr. Rabain. Now more than ever, our people need representatives that apologize for mistakes made since 1999. How about the representatives that apologize for the injustices since African descendants landed here. Careers in farming? Where did that come from? Fin Tech is short for Financial Technology. You and your leader are throwing it around as some sort of panacea for Bermuda. It is laughable. You are just trying to fool people into thinking this is a wonder-business. It isn’t. It is simply an alternative platform for payment processes, many of which are already out there in the market. Someone soon is going to ask you specifics….what will you say then?